In this multiple-exposure image, I am lighting an arrangement of lilies with the Hosemaster’s fibre-optic “hose”. The snaking ribbon of light results from the hand-held fibre-optic hose being moved during a long time exposure. On the tripod is my Fujifilm GX680 medium format film camera. The Hosemaster’s external shutter (explained below) is not positioned in front of the Fujifilm camera because it is being used in front of the 35mm Pentax that recorded this image (yes, it sounds complicated, but read on as I explain how this remarkable lighting device works). We all experience life-changing moments, and one of mine was purchasing a second-hand Hosemaster Light Painting System in 1999. That may sound exaggerated but the Hosemaster enabled me to perfect my style of light painting as well as define my work as a photographer. Previously I had been dabbling in light painting using a MagLite flashlight with a homemade foil snoot, but moving up to a Hosemaster enabled me to produce complex, repeatable images with accurate exposures. The Hosemaster opened a whole new world for me and for that I am indebted to Aaron Jones, the American photographer who developed the device in the 1980s. Jones travelled the world in the early 1990s, demonstrating the Hosemaster and convincing pro photographers that $6000 was a reasonable price for this must-have machine. However by the time I bought my Hosemaster second-hand, the device and its useage had fallen out of favour. 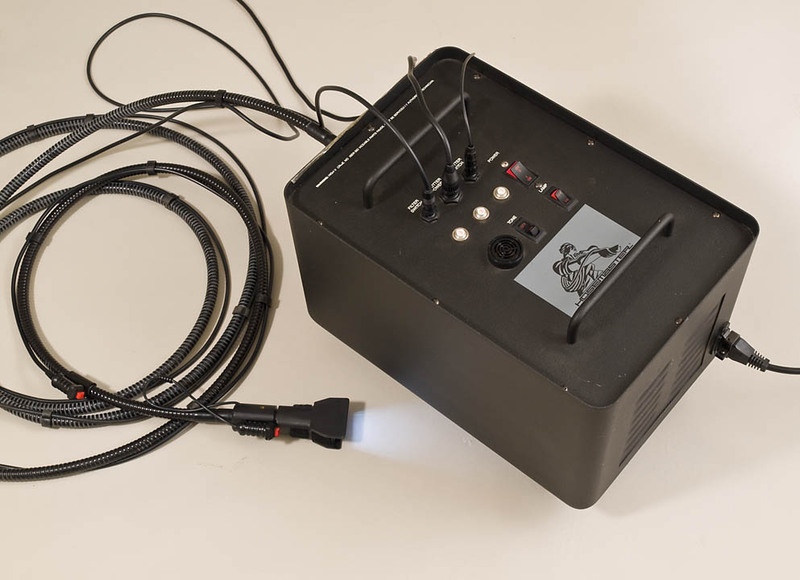 Essentially, the Hosemaster Light Painting System is a studio-based fibre-optic handheld light source that enables you to precisely accentuate elements within the frame. A key component of the system is an external shutter that allows multiple time exposures on the same film frame. A metal casing (on wheels) that houses a 300 watt arc lamp, a cooling fan and electronic controls. 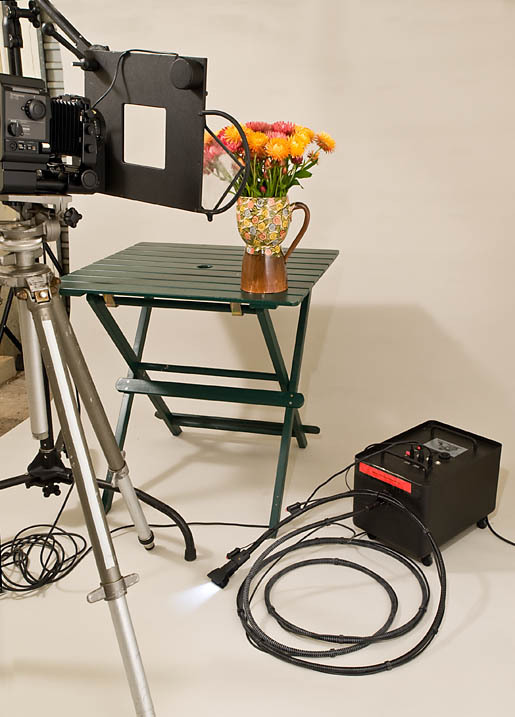 A 4-metre (13-foot) fibre-optic hose that conducts the light from the arc lamp to the subject being photographed. An external shutter that allows multiple exposures on a single frame of film. The beam of continuous light from the fibre-optic hose can be modified by various devices, including these masks. The red button switch is pressed to open and close the external shutter positioned in front of the lens. The action-end of the fibre-optic hose is effectively a small hand-held spotlight. 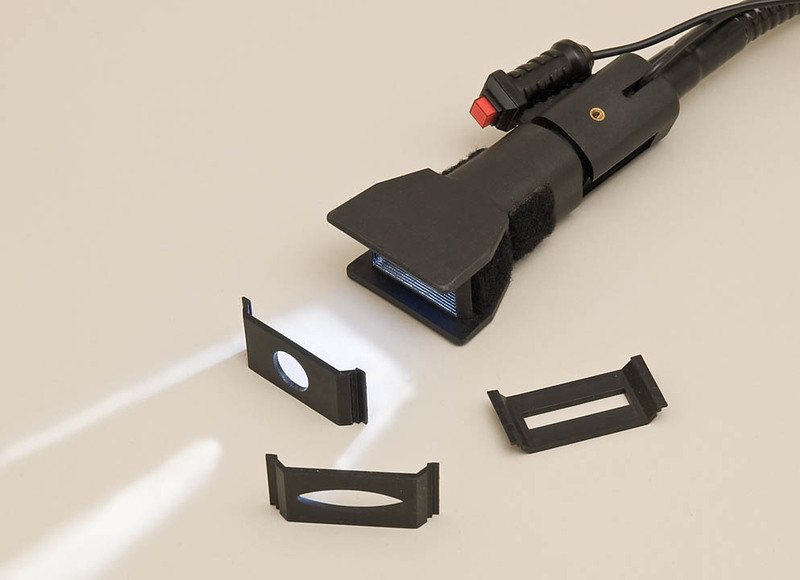 There are clip-on attachments that modify the light output. These include metal masks for shaping the light beam, a broad “paddle” (like a square table tennis bat) for creating softbox effects, a long “wand” (a strip light) for light painting reflective surfaces and small pointed “probes” that produce tiny spotlights. In the first image, the camera lens has a clear view of the subject through the open shutter “window”. In the second image, the closing of the shutter window marks the end of one exposure. With the lens view blocked, the lighting can be changed. Then the external shutter is reopened for another exposure. The crucial component of the Hosemaster is the external shutter. 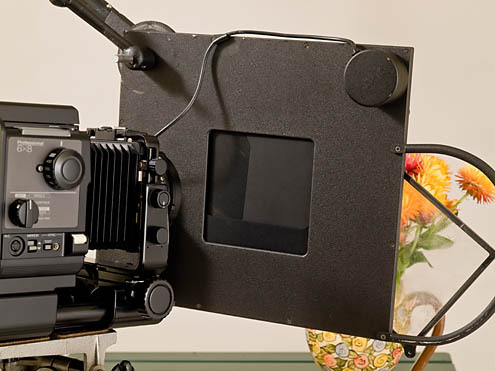 Mounted on a C-stand, this large black metal plate is positioned close to the front element of the camera lens. In the middle of the plate is a 13-centimetre (5-inch) sliding window. When the window is open, the camera lens has an unobstructed view of the subject. When the window is closed, the lens view is blocked. This sliding window is activated electronically by the press of a button switch on the end of the fibre-optic lighting hose. Press the button once and the window slides open, with an audible beep occurring every second. Press this button again, the window closes and the beeping stops. After repositioning the light and checking the exposure, the shutter window can be reopened for the required seconds and then closed again. In this way, a single film frame can be re-exposed many times. The metal casing contains the arc lamp and the electronic controls. The four-metre fibre-optic hose carries continuous “cold” light to the subject. For me, the Hosemaster is a dream lighting machine. In the studio, it enables me to produce multiple exposures of the same set-up, without touching the camera. The Hosemaster’s diverse range of light modifiers makes any lighting possible. Aaron Jones originally conceived the Hosemaster as a way of highlighting or emphasising elements within a set-up. 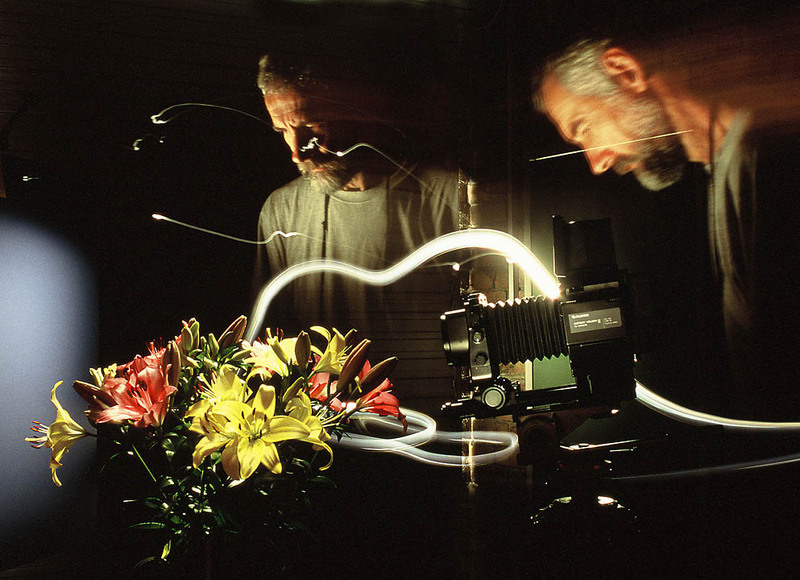 He often began a shooting sequence with an underexposed “base exposure” using a strobe, then re-exposed the same film frame multiple times using the Hosemaster to light paint the detail and texture of selected objects within the shot. Jones also added a special diffusion filter to the external shutter that allowed him to “blur” the light. This produced his signature lighting style that is evident in his “Still Portfolio” gallery at http://aaronjonesphoto.com/ My lighting style is very different to that of Aaron Jones. I don’t use strobe lighting at all. I rely on the continuous light from the Hosemaster for all my lighting effects. It enables me to create an image with multiple light sources, as broad or as focussed as I choose. 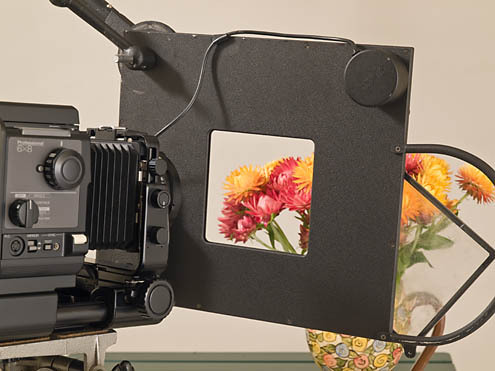 In the studio, after I have composed my subject (for example, flowers) in front of the camera, I use a large C-Stand to suspend the external shutter close to the front element of the lens. With the external shutter’s “window” open, I check that the camera has a clear view of the subject. Then I close this window so the lens view is blocked. The Hosemaster lamp is turned on, the house lights switched off, and the film camera’s shutter is locked open using the “B” setting. I don’t touch the camera again until I’ve finished the entire lighting sequence. At this time no exposure is effectively occurring because the lens is pointed at the black surface of the external shutter window and there is no other light in the studio except that coming from the end of the fibre-optic hose. 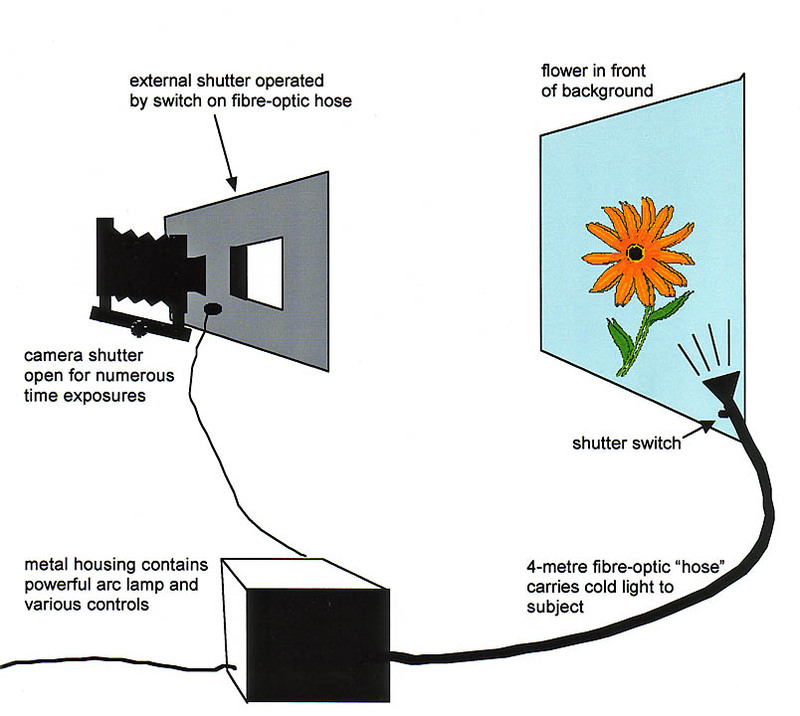 The film in the camera is unaffected until I choose to press the button switch at the end of the hose, and the shutter window slides open to reveal the subject lit by light from the fibre-optic hose. I usually expose the background first. 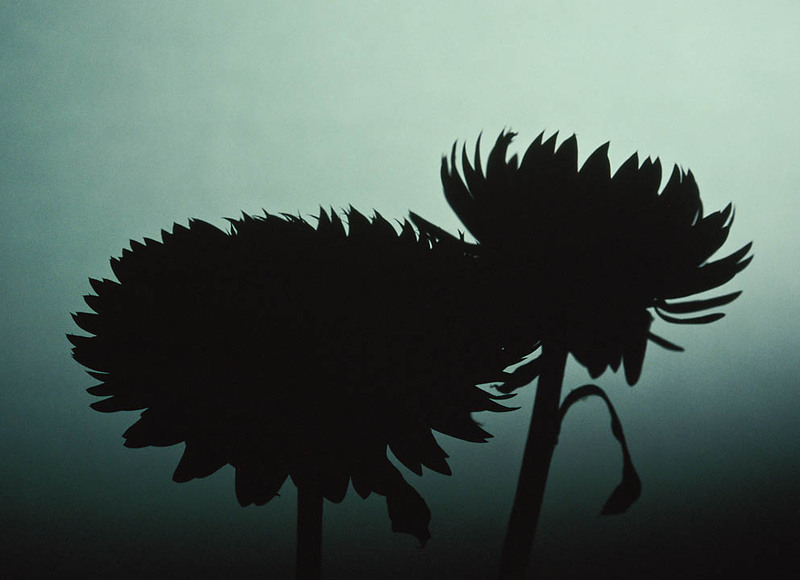 This long exposure silhouettes everything in the foreground (in my case, the flowers). When that exposure is finished, I press the button on the end of the hose and the external shutter window closes. With the lens view blocked, I reposition the hose light and prepare to individually spotlight each of the flowers. The advantage of handholding the hose is that I can precisely position the light at any angle. 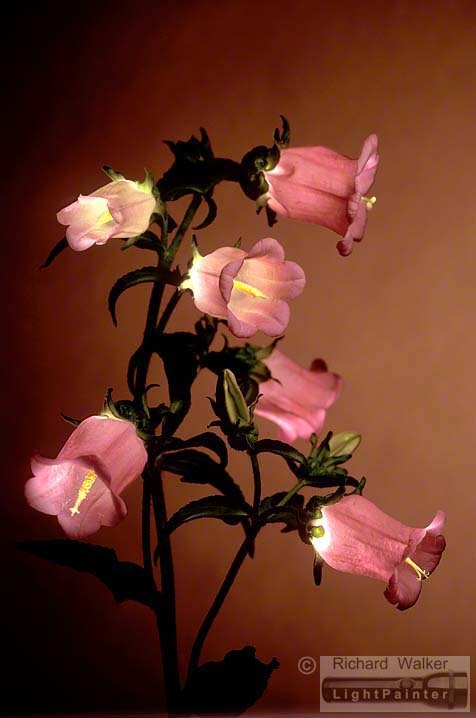 The Hosemaster gives me the freedom to light each flower differently. It is important to keep in mind that the light output of the Hosemaster is balanced for daylight film so I shoot a low ISO transparency film like Fuji Velvia. I use a light meter to take incident light readings of the hose light in each new position. Because I expose at f.16, my meter readings are between ten seconds and two minutes, depending how close I hold the fibre-optic hose to the subject. When I push the red button switch on the end of the hose, the shutter window slides open, signalling the beginning of an exposure. The device now beeps at one-second intervals. I count the necessary seconds then press the switch again so the shutter window closes. That’s one exposure. I move my light to a new position, take a new meter reading (if necessary) and open the external shutter to make a second exposure. I continue to make multiple exposures on that single film frame until my lighting is complete. 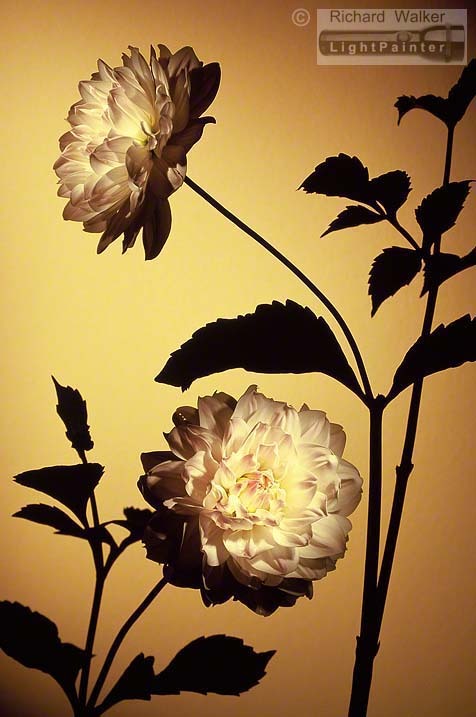 I wanted this floral portrait to look as though each flower was lit from inside – like an art nouveau table lamp. I used a small probe attachment on the end of the fibre-optic hose and aimed the light inside each flower, being careful not to overexpose the foreground stamens. 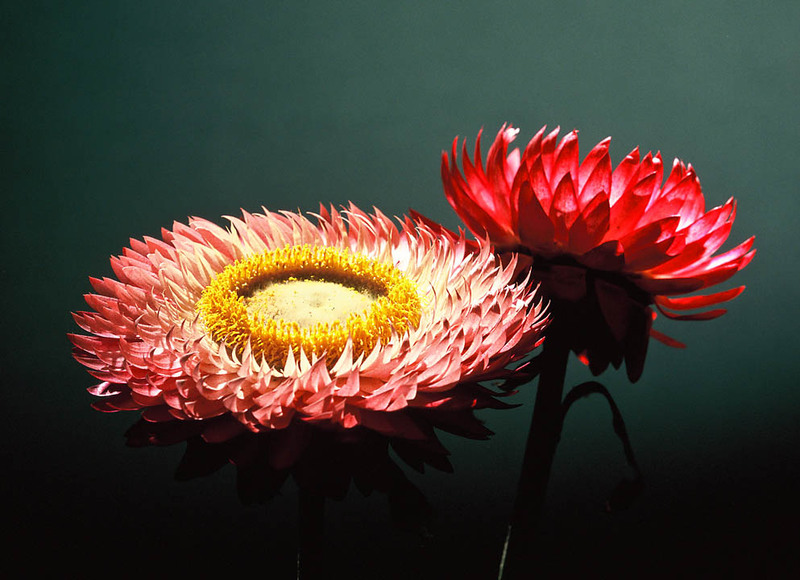 This image has eight separate exposures: the background; soft fill on the entire arrangement; and individual spots for the interior of each bloom. 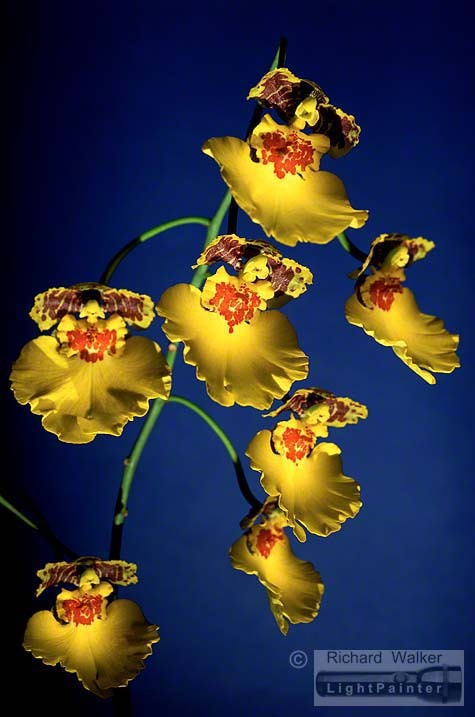 There are nine separate exposures in this orchid portrait: one for the background; the seven blooms were individually exposed; and finally the arrangement was lit from underneath to highlight the edges of the petals. During this precise work the flowers cannot move a millimetre, otherwise there will be a slight shift in the flowers’ positions in the next exposure. 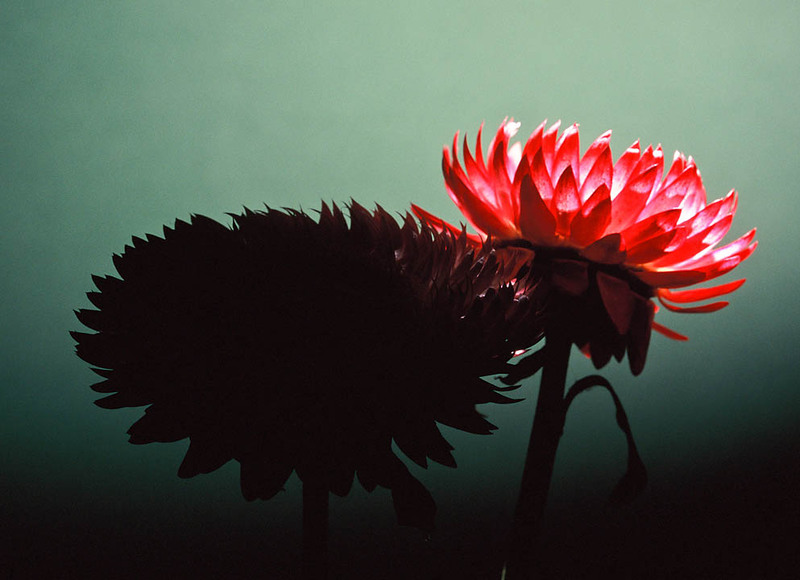 The shift is obvious in the final image, appearing as a drop shadow around the edge of the flowers. For years I have used this image — displayed as a framed 102 cm x 73 cm (40 in x 29 in) print — to draw people to my exhibitions. I call it my “people magnet” because the intense yellow and blue contrast seems to attract immediate attention.